Adorned with our Snappy pattern, this large coupe serving bowl is a wonderful addition to any table or buffet and also makes for a special gift for the sea lover in your life. Generous in size, and graceful in form, this eye catching bowl will become a house favorite. 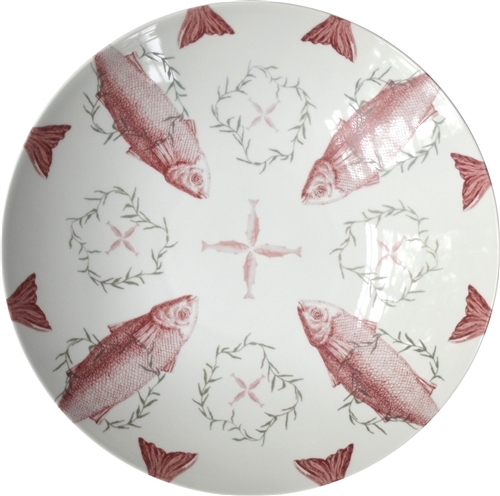 Vintage fish engravings printed in rich rosy tones and hand-drawn botanicals seem to dance around this elegant vessel. Hand-decorated. Made in America exclusively for Nourish™. Measuring 13.5 inches in diameter and 2.75 inches in height. Add to the look with our Sealife Small Coupe Bowls and our Snappy Platter. 13.5 inches in diameter, 2.75 inches in height, hand-decorated and made in America exclusively for Nourish™, lead and cadmium free, fully vitrified. This serving bowl, part of the Sealife line of serving ware, is inspired by my travels and the beautiful people I have met along the way.